What can you do if there isn’t enough money for Christmas? Will something good happen or will you have to punt? When I was a little boy, my family did not have a lot of money. My father had a reasonably well paying job, but with four kids and a dog, money was often tight. This is not to say that we were deprived or unhappy. Our family did many activities together, but our favorite was camping, which we did year-round, blazing heat or freezing cold. It was a great site to see the whole clan scrambling to get everything together for a weekend trip. The whole family then piled into our Chevy station wagon with a dog bigger than the three smallest children put together. Dad would then tie down our trusty tent to the top of the Chevy and off we would go. over patches but it was still our faithful camping tent. But alas, canvas can only last so long, so after about ten years of steady service, my Dad admitted one summer that our tent was no longer useable. We didn't go camping at all the following fall. The only thing that kept us kids controllable was that Dad promised we would get a new tent at Christmas, and we could go camping all winter. So Mom and Dad went on a savings program to get the money for our new tent. They even got us kids to pitch in a little. Money was tight, but the savings accumulated, and we all had visions of a great winter outdoors. That is, until disaster struck in late November, and my little brother Johnny broke his arm. Dad hadn't counted on an emergency, and the hospital and doctor bills completely depleted our tent saving. We were all downcast at the prospect of no winter camping. Even I was almost sorry I pushed Johnny off the roof. So as Christmas approached, we were all pretty glum. There weren't as many presents around the tree as usual, because the extra money had gone into my brother's arm. Finally, Christmas Eve was here, and our month long depression was lifted a little, because we could open our presents. Dad had to work, but he was late, and hadn't called. Mother began to worry, and just before she called the police, Dad drove up. We couldn't believe our eyes! There on top of the Chevy was a brand new shiny tent, even larger than Old Faithful. Instantly, five voices started asking Dad question after question, so he ushered us all into the living room, around the Christmas tree to tell us what happened. It seems that Dad had seen an advertisement for a store called SURPLUS CITY (all caps required). Last week he had gone by to see if they had any tents that we could afford. There was one perfect tent (the only one actually) for $60. So Dad worked a little overtime and scrimped a little on his Christmas gifts and he scraped together about $45. That night he had gone to SURPLUS CITY with his $45 and tried to get a bargain on the tent. He had managed to chisel the manger down to $50 for the tent, but from there the manager wouldn't budge. There was no credit or lay-away at SURPLUS CITY, either, just cold hard cash. So Dad went back out to the car, and thought about how hard it would be to come home empty-handed. In a flash of inspiration, he got the spare tire from the car and went back in. He asked the manager if he would take the spare tire for $5 so he could buy the tent. With that act of desperation, the manager's heart softened. What with it being Christmas and all, and my father being so intent on getting the tent, and stopping in several times over the past week, he let Dad have the tent for $40. When Dad finished telling this story, we all cheered and hollered and generally made fools of ourselves. That was the happiest Christmas I have ever had. And that was the best winter of camping we ever had too, in THE WINTER OF OUR DISCOUNT TENT. If you enjoyed reading this story, please let me know! Authors thrive by the feedback they receive from readers. It's easy: just click on the email link at the bottom of this page to send me a message. Say “Hi” and tell me what you think about A Christmas Story. Thanks. 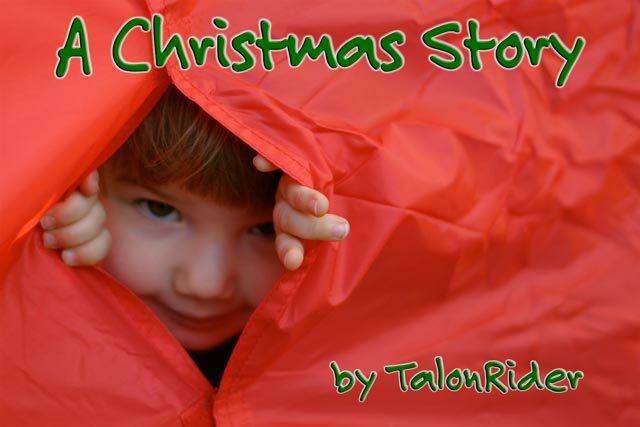 This story is Copyright © 2014 by TalonRider. The image is Copyright © 2007 by ArminH | freeimages. They cannot be reproduced without express written consent. Codey's World web site has written permission to publish this story. No other rights are granted. If you don’t understand what the words in bold at the end of the story are all about, click here to find out.